UPGRADE YOUR TOP PRODUCER CRM REAL ESTATE MARKETING LIBRARY AND POSITION YOURSELF AS THE "LOCAL MARKET EXPERT"
EMPOWER YOUR CLIENTS WITH REAL TIME INFORMATION DIRECTLY FROM THE MLS. THEY WILL LOVE YOU FOR IT! Click here to view a sample of the Market Snapshot report! Click below for examples of our real time LISTING, PRICE CHANGE AND SOLD ALERTS. With help from SendGrid, Market Snapshot® email open rates are consistently high (Click Here). If you want people contacting you from your marketing you have to make sure your message is consistent, and that you give them a reason to respond. Get professionally designed responsive landing pages with beautiful high resolution background images. Quick and to the point, these landing pages can be emailed to your contact list, or linked to your advertisement to capture leads and automatically send them a Market Snapshot. Brand New: Generate more listings with your own leads using our customizable unlimited lead capture landing pages with the Market Snapshot. 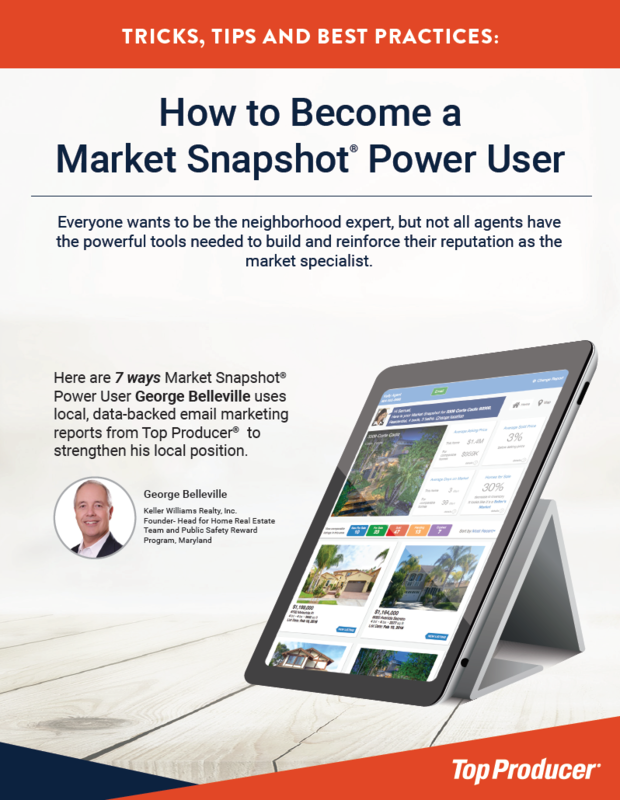 Here's how successful agent, George Belleville, uses Market Snapshot to strengthen his local position.